In the past, we relied on the standard TM symbol for "trademark." This offers very real legal protections. But the ® symbol and designation strengthen our protection greatly. They allow us to more easily pursue legal action against those who infringe on the use of our name without express permission -- and to seek damages, court costs and legal fees. We've found this new level of legal protection necessary because ... well, because our name is such a good one, quite frankly. 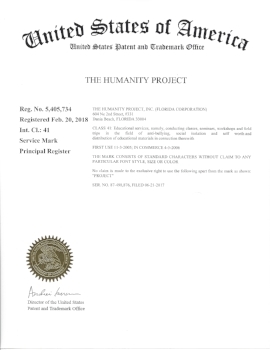 Several organizations have tried unsuccessfully over the years to borrow "the Humanity Project" without our permission. We make diligent efforts at the Humanity Project to deliver free programs for kids (and parents) that create meaningful changes in society. Every day, we promote our stated core values of respect, diversity and self-worth. To continue doing this, we must keep our brand safe in this complex Internet-driven world. That small symbol, ®, is a big help in accomplishing this goal.